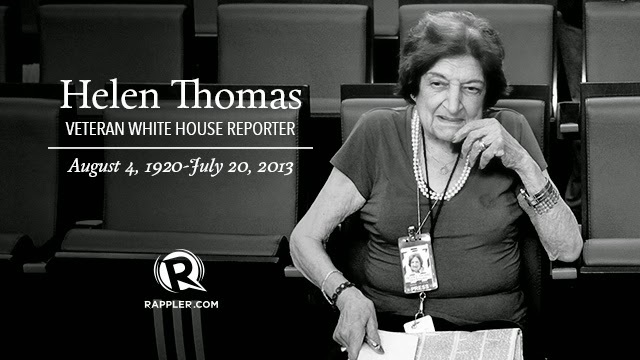 Helen Amelia Thomas (August 4, 1920 – July 20, 2013) was an American author and news service reporter, member of the White House press corps and opinion columnist. She worked for the United Press and post-1958 successor United Press International (UPI) for 57 years, first as a correspondent, and later as White House bureau manager. She was a columnist for Hearst Newspapers from 2000 to 2010, writing on national affairs and the White House. She covered the administrations of eleven U.S. presidents—from the final years of the Eisenhower administration to the second year of the Obama administration. Died : July 20, 2013 (aged 92) - Washington, D.C., U.S.